Terrorists hit the Pentagon with a 130,000 pound airplane traveling at 345 mph with 9,000 gallons of fuel on board. The World’s Largest Office Building suffered great physical damage at the point of impact. Water damage from sprinklers and fire hoses affected adjoining areas, and smoke and soot quickly filled the 6.5 million square foot structure. Rescue operations commenced immediately and, combined with the structural strength of the building, prevented a more devastating loss of life than the 125 soldiers and civilians killed in the attack. At the same time, actions were taken so that evacuated personnel would be able to return to their jobs as soon as possible. The need for expert clean-up was second only to the rescue effort. 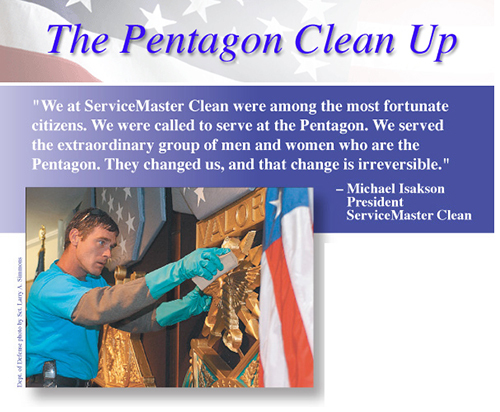 The Pentagon called ServiceMaster Clean at 11:30 a.m. on the 11th. The ServiceMaster Recovery Management staff, dedicated to catastrophic disaster mitigation and restoration, was on the move by noon, and was at the Pentagon on September 12th. At 8:30 a.m. that day, a crew of 50 ServiceMaster Clean technicians mustered in the Pentagon’s western parking lot. Supplies and people from ServiceMaster Clean local offices were mobilizing up and down the East Coast and as far away as Michigan. Two ServiceMaster Clean restoration shifts worked 24/7 for five weeks. A day shift completed the job on November 16th. Five million square feet of office space was back on line.